Like last year, For the occasion of Mehregan I am participating in a Persian Food round up organized by Persian Food Bloggers. Please scroll down to see the links to other Fall-theme Persian dishes prepared by my friends and colleagues, and follow these two hashtags #PersianFoodBloggers #PFBMehregan. Back home, early September was when my mother used to make stuffed grape leaves not only for our own large household but for the entire extended family. We had a tent of grapevine in our backyard you see, and mom never failed to make the best use of them twice a year, in spring and in Fall. 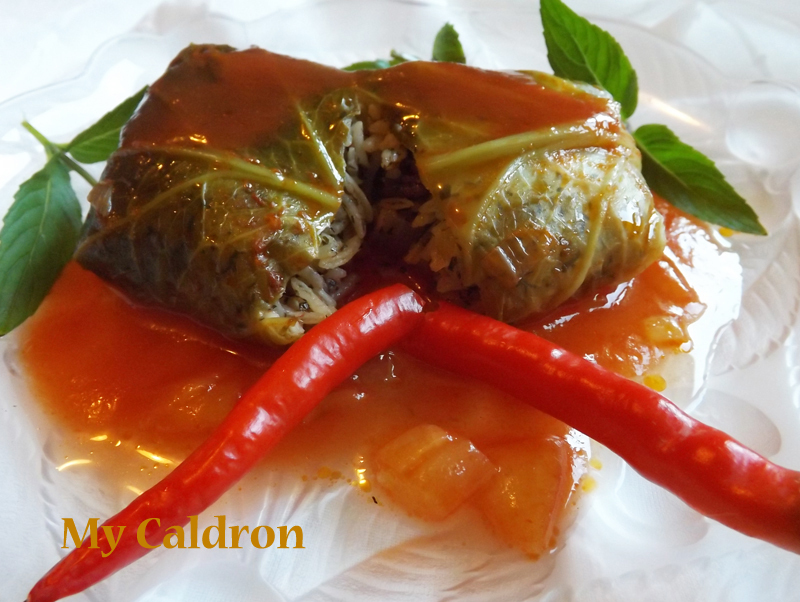 I loved (and still do) all types of stuffed leaves and vegetables, called dolmeh. 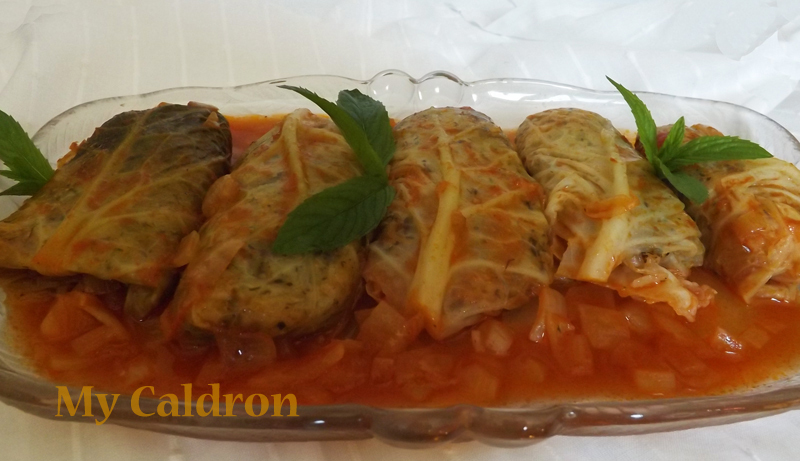 So far, I have included in my blog only grape leaf domeh and vegetable dolmeh – which leaves us with another savory type – Cabbage Leaves dolmeh – reserved for this Mehregan2015 occasion! Just a few words before getting into it. All Persian recipes for dolmeh – whether it is grape vine, vegetables or cabbage leaves, contain ground meat, rice and split beans as their main component. 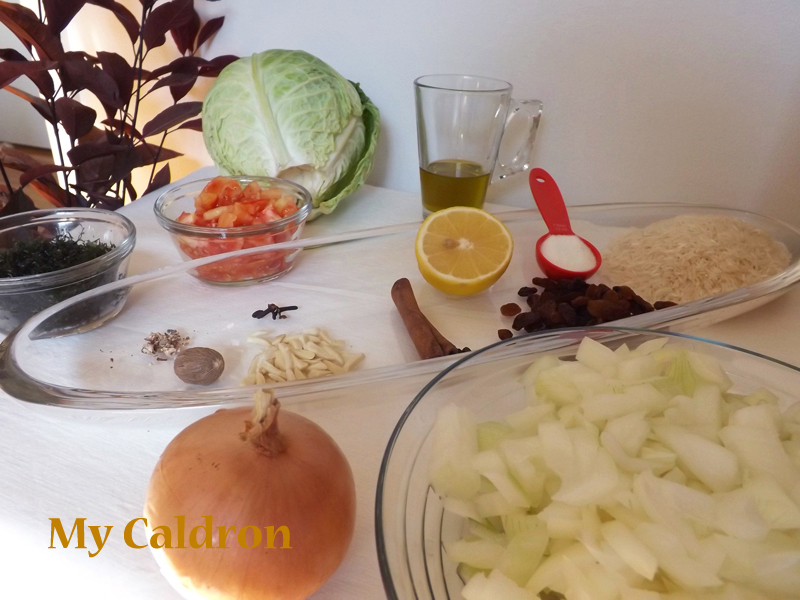 The recipe I have here, however is inspired by Najaf Daryabandari’s Turkish cabbage dolmeh. And has only onions and rice as its main component plus small amount of tomatoes, raisins, silvered almonds, dill & mint mix and an array of delightful spices such as ground cloves, cinnamon and nutmegs. I have made several small changes both to the spice proportions and cooking style of Daryabandari’s recipe, which has resulted in a more delicate and subtle feel of unusual spices. More importantly, I have added a tomato-based sauce to it, making it softer, richer and juicier than the above-noted dolmeh recipe. For the sauce, I have got inspiration from my favorite Persian food blog, Turmeric and Saffron. 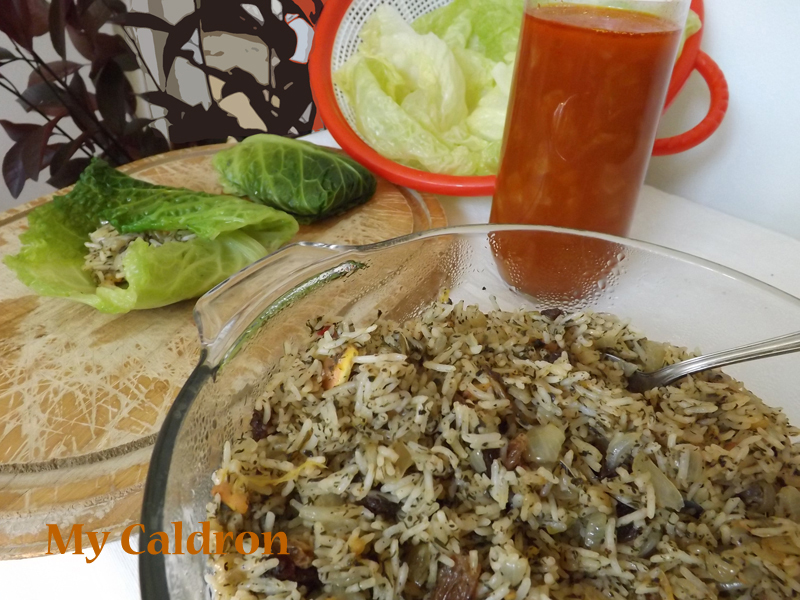 Overall, this vegetarian version of cabbage leaves dolmed has a slightly sweet, some sour taste to it, with delicate cloves/cinnamon/nutmeg aroma; it is dense, juicy and occasionally chewy! 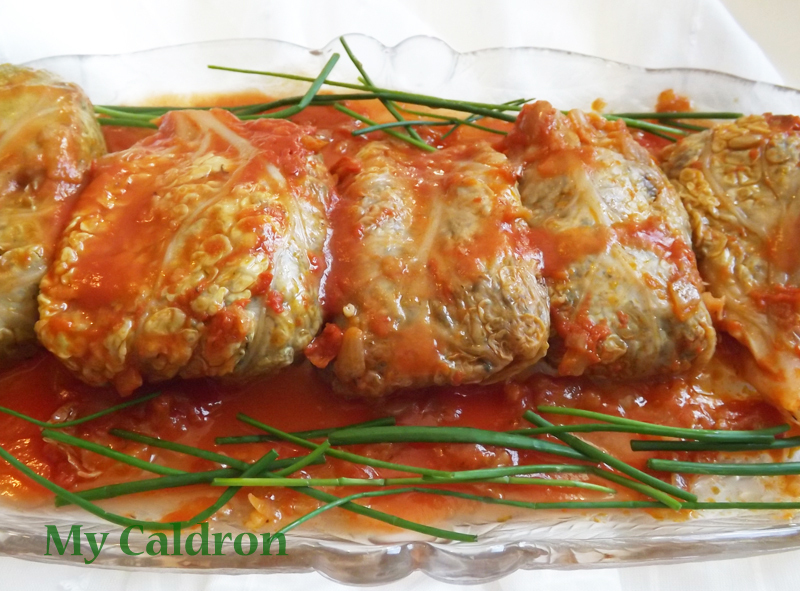 Like most Persian foods, the preparation and cooking of this dolmeh takes time, attentiveness and patience; You might be surprised though to discover how much fun you would have in the process as different ingredients change form and colour – just like autumn leaves, turning from white to light golden, or pink, while emanating excitable and happiness producing fragrances. My folks tried this and absolutely loved it; Hope you do too! 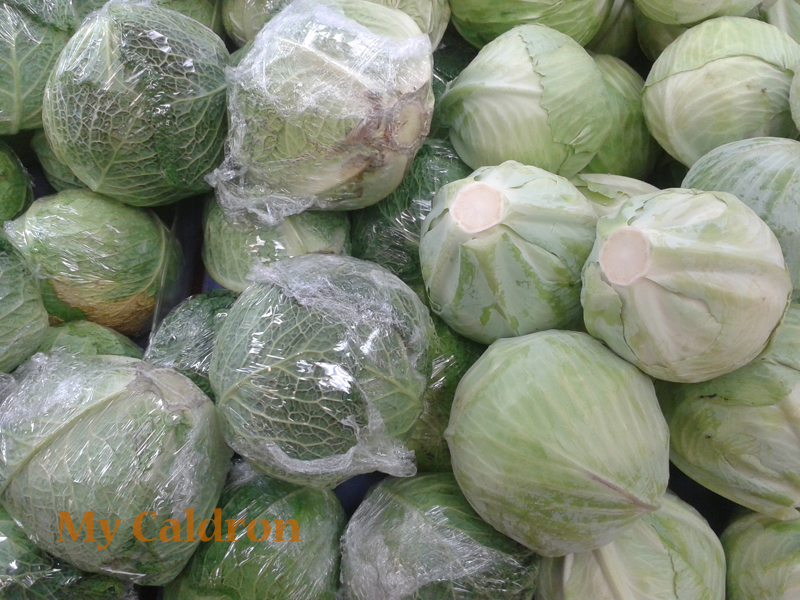 Place whole cabbage in a large pot and cover it with water and 1 tbsp. salt. 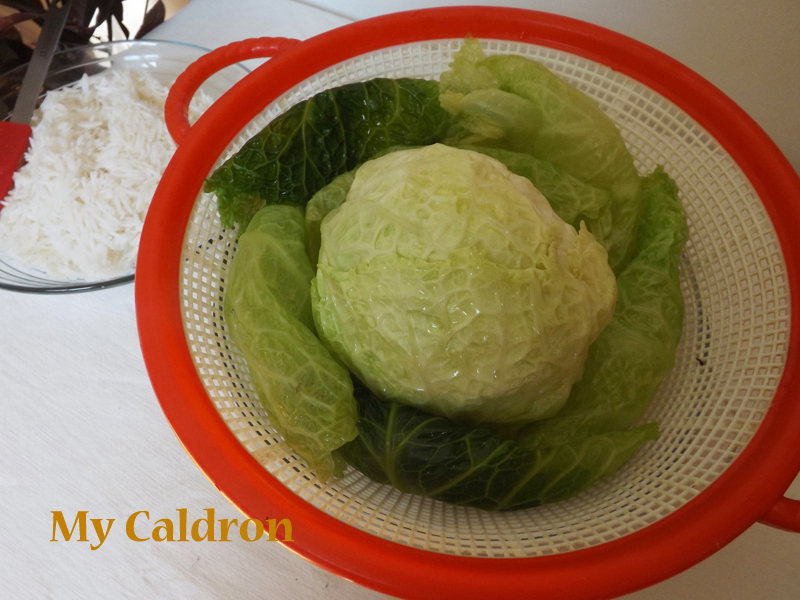 Bring to boil and let the cabbage cook long enough for the outer leaves to get soft. Remove from the pot and place it on a cutting board. Gently peel cooked and soft leaves (without tearing them!) and place them in a colander. Once you reach hard leaves, take the cabbage to the boiling pot again. 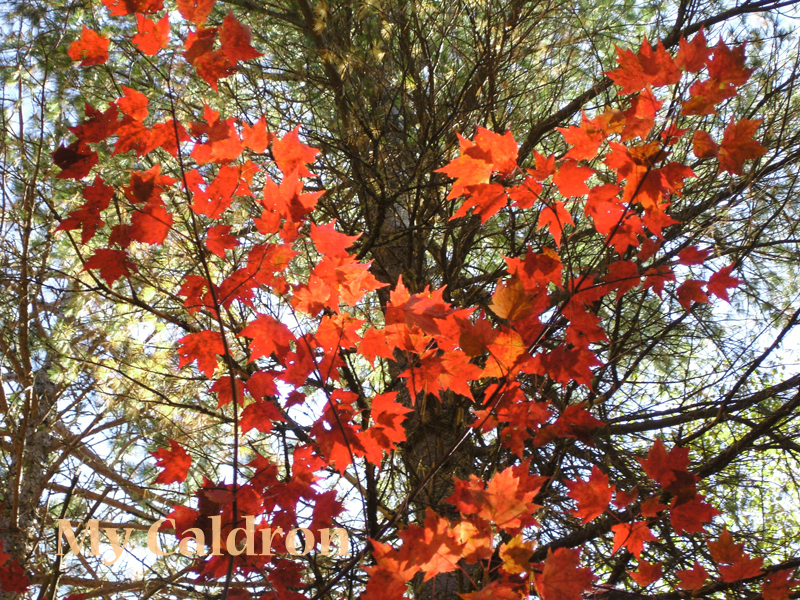 Continue until you have all the sizable leaves done. You may need to cut out the hard rib in larger leaves. Use a medium to small pot to rinse the rice several times until water runs clear. Pour off water. Add 1 cup of water, and a pinch of salt and oil. Cover the lid and bring to boil. The remove the lid, reduce the heat and continue to cook until all water is absorbed. With a spatula, transfer the rice in to a bowl. Cover and set aside. In a large non-stick pot, heat 3-4 tablespoons of olive oil over medium-high heat, add the chopped onion and stir fry until transparent. Add the silvered almond and continue to stir fry until almonds color are changed (about ten minutes). Add the cooked rice and chopped tomatoes and stir for a few more minutes. You will notice the rice slowly gets a light red color. Reduce the heat and add the chopped herb mix, raisins, and all your dry spice: ground cinnamon, nutmeg, cloves , salt pepper, in addition to 1 tbsp. freshly juiced lemon or lime. Cover the lid and steam cook for no longer than 5-7 minutes. In a small pan, sauté the sliced onion in 1 tablespoons of olive oil until light golden, Add three tbsp.. of tomato paste, sauté for a couple of minutes. Add ½ tbsp. sugar and two tbsp.. fresh lemon juice and two cups of water. Simmer until it thickens a bit. Transfer the contents of your main pot in to a bowl and mix well. Wipe the pot clean no need to wash) and return to the stove. Depending on the size of the leaves you may need to scoop 1-2 tbsp of the mixtures into the center of each leaf before folding it in square or cylinder form. Visual wise, the leaves steam should be faced up (inside dolmeh); this would be opposite of the each leaf’s natural inward curve. So, in the process of boiling the leaves you should make sure they get soft enough to endure the twist. Heat 2 tbsp, oil in the pot. 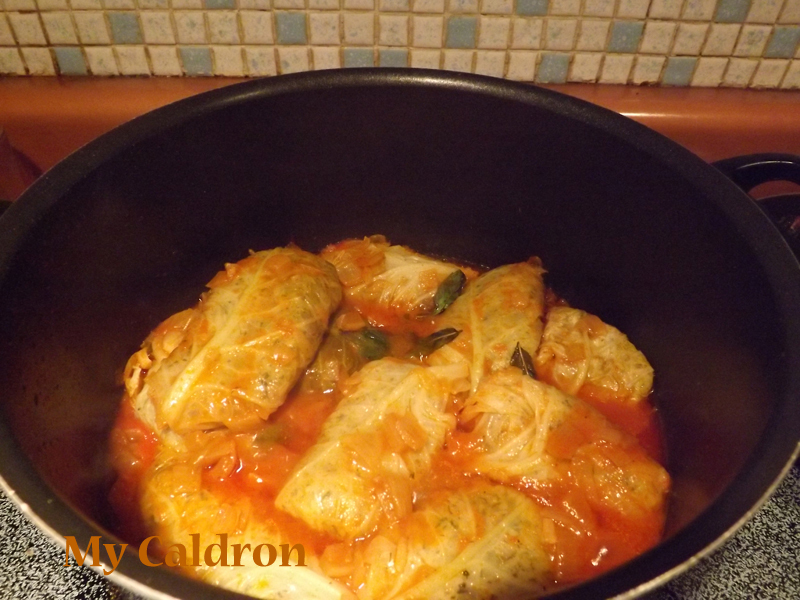 Arrange the stuffed and wrapped cabbage with the fold down next to one another in the pot in layers. Add the sauce. cover and cook on medium-low heat for an hour. At the end of the cooking process you should still have enough sauce left at the bottom of the pot to top dolmeh on the serving platter. Serve hot as side or main dish with fresh herbs, flat bread and any type of salad you fancy. 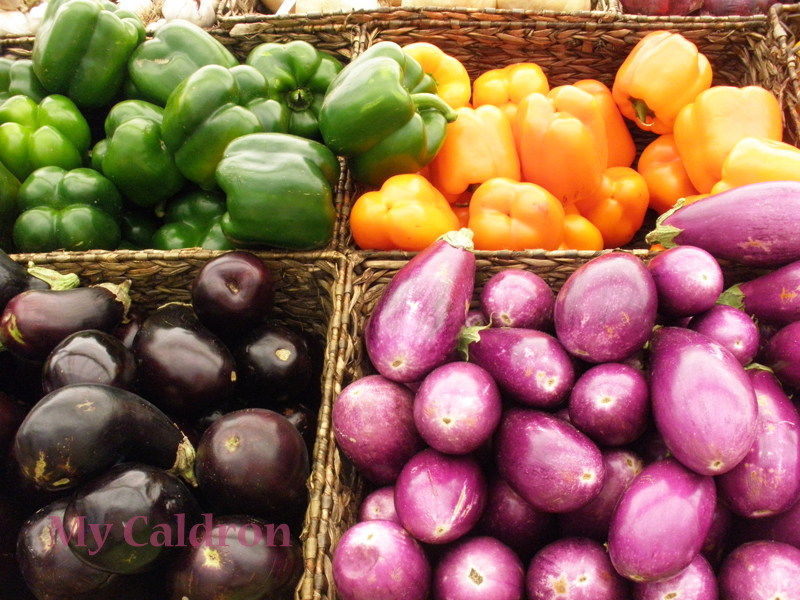 And remember, you can use bell pepper, eggplants, or any other fall vegetables with the same stuffing. Enjoy and Happy Mehregan to you all!